One thing I know to be true: I am a girl born for cornfields. It's just in my blood. Some people find peace on the baking-sugar sands of the coast. My heart slows when I'm surrounded by something like this. All the better if there's a barn or two scattered among the green. This 4th of July was one for the record-books, even if it was technically July 3rd. Ah well, Patriotism knows no limits. It makes me happy when Ruby gets a chance to giggle-box around with a passel of girls. Calvin whined for a while, "But there's no one for me to play with!" Before long though, he got with the program: Girls are pretty rad, too. And now, a word on the food. My cousin Allison rocked my world with her zucchini carpaccio. I'm on a fierce hunt to recreate it and when I do, you'll be the first to know. But what I really need to tell you is this: Spicy brown mustard, sauerkraut, jalapenos, green onions, yellow mustard. BEST. Hot Dog. EVER. It's true that I fell victim to a Level VI stomach bug the following morning, but I know in my heart that the hot dog was not to blame. And yes, my extended family really is this creative. There was much gaming and frolicking and, in my case, pure, delicious lazing. Nary a mosquito among us. Air that gave in just enough so that we were comfortable without going to the van for a jacket. The sun dipped a bit. As it turns out, two plastic cups work just fine for catching lightening bugs. Silas could scarcely wrap his mind around a bug with a built in "pitty light". There was Alison Krauss and Italian Swing music and I could swear I heard a bluegrassy line or two. My kids ran wild, just like I used to, and maybe will again. It could happen. I held fort with this guy, in the beloved lawn-chair circle, where the only view you need is whoever happens to be sitting across from you. I'm only realizing now that Silas may have spent a little too much time at the tea cooler. It may explain a few things... And I think the lady in red (aka "Gam") may have had a hand in the matter. It was one of those nights that no one wanted to rush. We had all the time in the world. I'm a flag-waver. It's stitched permanently into my heart, along with iced tea, sauerkraut, pickled beets and dinnertime prayers that sometimes go an extra round. I'm thinking I'd like to carry this 4th of July (3rd of July, 5th of July, whatever) feeling around for a while. It just feels right. *Calvin pics, tractor pic and cute baby Corbin pic courtesy of Cory. Was that an old wooden outhouse as well? And that baby who was your seat partner? A-Dorable! I also found myself thinking: I'll bet she's wearing a sweatshirt or something similarly LOCO with that skirt and I'll bet it looked GREAT! How?? I LOL at the part where you mentioned that Silas could hardly believe a bug could also have a pitty light inside of it- too funny! Thanks for being my midnight snack once again! That last pic of Ruby is stunning for reals. Oh! I just love it. The post. The corn. The kids. The love. Always the love. I love the love. Love, love, LOVE the love. love it all! This whole post...yes, LOVE! the corn field?! 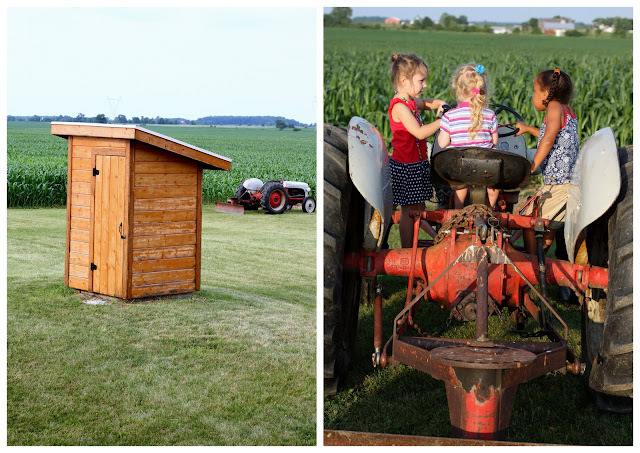 (we have a huge corn field you can come stand in with our barn and silo in the background), i loved the pictures of the kids playing and all the beauty you took in over the holiday!!! lovely post indeed! we had a pretty great one too, but boy oh boy Tuesday was a doozy. Enjoyed this post! Wait...what am I talkin' about? I enjoy all of your posts! I think you live in Better Homes and Gardens. Really, when I read my subscription it whispers Shannan, Shannan...but not in a creepy way. Harikasınız, çok tatlısınız. Sizi izlemeyi hiç kaçırmıyorum. Bana ilham veriyorsunuz. Looks like an excellend, old-fashioned good time was had by all! I love cornfields too. We get them less in Europe but I do have fond memories running through French cornfields as a kid. There's something deliciously secretive about them as you can hide among the branches. And that food just looks yummy! I'd like the recipe ASAP. I have a fridge full of zucchini and no where to go. fun post. favorite is silas caught red-handed with the tea. totally looks like he KNOWS he's gettin' away with somethin' ;) (and Gam who is just doing her job!) Happy 4th-that-was-really-on-the-3rd! What a wonderful tradition and memory you are creating for your little Americans! Stop by. I am hosting a give-away Miss Ruby would love! I'm a city girl who often finds herself craving the wide open places of your photos - the past week has been one of those times. And I have to say, I found myself breathing a sigh of relief and relaxing into my chair a little just reading this post. Thank you for sharing the beautiful space with me! the farm looks so relaxing. what a great day you had...sorry about the flu thing. i think i've told you how i feel about the flu :/ have a great day! Such good pics and looks like you had a great time. I'll admit...I'm a sucker for cornfields too. Ours is slower this year because of the rain, but it's coming. And I'm also a sucker for that skirt. Sauerkraut AND jalapenos? Be still my heart. I'm feeling a hotdog in my near future. And passel? You used the word passel! Love! It! And love this 3rd/4th/5th of July. You make me want to be a farmgirl. I've always lived by the beach or in the mountains so I'm living vicariously through your cornfield loving self. Stunning pictures. I want your skirt - I saw it at Old Navy and thought of you... I've become obsessed with stripeyness. I almost feel like I was there. It sure looks like you had a wonderful time. You had me at cornfields. I heart those as well :) Glad you had a great holiday. It looks like such a great day. As someone who grew up in a house surrounded on four sides by corn fields (sometimes soybean, for crop rotation ya know), I can totally relate. I love that view as well. Doesn't everybody?! These photos are so beautiful. They please more than they eye.... they speak to the heart. you do independence day up right. i have no recollection of what took place here on the 4th (or the 3rd), but i rest assured you covered us on the celebratory front. ps love siley's expression in the tea shot. that child is the best sort of adorable. I have some photos of a corn field waiting in the wings of my blog. Corn fields are so dreamy. I love the "swishynes"s of the tops. Looks like you had a great weekend. I know we did. My youngest was baptized! That was supposed to say my oldest. I really do know the ages of my children! I miss the cornfields. Oh, I was so homesick on the 4th. We don't have lightning bugs out here! Come August, we'll be bug catching fools and I can't wait. This looks so so perfect and your skirt is adorable. Now that's a proper 4th of July celebration! Family, good food, perfect weather...it all looks like a classic snapshot of Americana! Would you please ask your momma if she would like to adopt me? Kidding aside...you have a beautiful life and I love that you appreciate every detail of God's blessings and goodness. Cornfields, barns, babies, Alison Krauss, family--love it. But I'm not convinced about the sauerkraut and pickled beets. I love looking at your pictures of the fields,barns, and farm houses. I was born in the mid-west, but was raised down south. I am drawn to that land. This German girl loves some sauerkraut and pickled beets! I agree about keeping the patriotic feeling going. Today in the cute little old down town part of Gilbert, there was an elderly couple riding a big tricycle with their flags still waiving...love it! What a patriotic and fun day!!!!!!!!!! I've got 4th of July envy. What a fun time. It all looks so familiar. I wonder if your parents live close to my cousin on 29. Actually I lost that cousin a few months ago to H1N1 but her husband still lives there in a corn field. Silas looks so grownup. Your Mom looks like a sweet Grammy........who is hiding behind her, hah. such gorgeous pics, really beautiful! makes me want to catch the next plane out of this crazy TX heat, especially to have one more night catching lighting bugs...oh I miss those. Next year I want to be invited to your Fourth. Wish I were there...looks perfect! 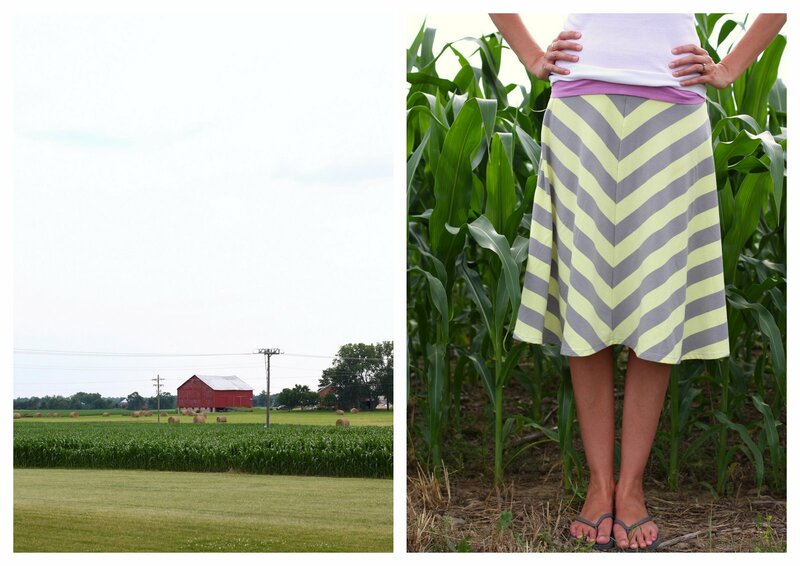 I love the cornfields + the Midwest, too. On Tuesday, I took the kids I nanny to pick blueberries. We drove back country roads from the blueberry farm to another farm to pick up some homemade donuts and soda. it looks great and all but were the toothpicks edible??? fantastic celebration style. love it. your ruby is beautiful! and anywhere alison krauss is playing is a party done right. i wish i was a kid again, chasing lightnin' bugs in my bare feet. Sounds idyllic. And (chance to brag here please forgive me) I just saw Allison Krauss a few weeks ago and she was fab-u-lous! I LOVE that photo of the sun through the tree. Beautiful. What a picturesque setting! Thanks for sharing!